As much as I love to share the wonders of America with my kids, the main reason we undertake so many family road trips is to visit our family and friends. My immediate family is spread around the country, as are the close friends who have become a part of our extended family. So when I have the rare pleasure to share a meal with our long-missed dear ones, it’s an event. Last week, this special occasion was marked by another rarity, the production, for the first time in over a decade at the Thompson garden, of monster zucchinis. They demanded nothing less than a family heirloom recipe – Grandma Muller’s Stuffed Zucchini, as shared by Diane Thompson. Peal and split a very large zucchini in half. Hollow the center (seeds) out of it. Place in a microwave safe dish. In a mixing bowl combine hamburger meat, finely chopped onion, Italian breadcrumbs, garlic salt, Lawry’s season salt and catsup to taste. This is my basic meatloaf recipe. Mix together and place the meatloaf mixture into the hollowed out zucchini. Bake at 375 degrees until meat is thoroughly cooked. 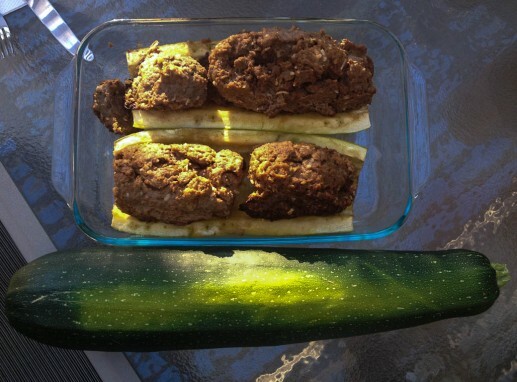 If the zucchini is not done remove the meatloaf and place the zucchini into the microwave and cook 3-5 minutes on high. Place meatloaf back into the zucchini to slice and serve. Just in time for the zucchini onslaught of summer!